Here are the quilts shown at our November meeting! 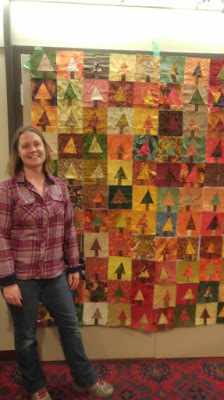 Kim won a block lotto (she wouldn't say how long ago) and finally finished the quilt! Nicole's polaroid quilt, which was on display at the McPherson Theatre and has sold! New member Susan made this trippy quilt for her bed! Block Lotto: this month there were over 100 blocks contributed, and the lucky winner was Natalie! 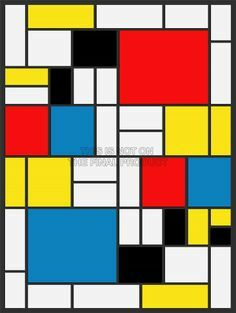 This month's block is inspired by Piet Mondrian 's art. How quilty is that art?? The other influence was working on a hexagon quilt. I had only done a Y-seam once before, but doing a few more got my brain going and thought we could all do this. THIS BLOCK LOTTO IS NOT TO BE TURNED IN UNTIL THE JANUARY 2019 MEETING!! Fabric you will need: four 7" squares, one of each colour- Red, Yellow, Blue, and Black. Must be solids! If you are worried about not getting to the 6.5" size, you could start with a 7.5" square, but it does work with the 7" if your seams are a scant 1/4". Stack the four blocks stacked, yellow at the top. Find and mark your center, (3.5" from top and sides). Next draw a straight line from center down, and 2 diagonal lines from center to each top corner. Now it's time to cut! I used my rotary cutter to almost the middle mark, then scissors, but do whatever is most comfortable for you. I cut all four pieces at once, but again go with what works for you. This next photo is after my rotary cutter, but before snipping with the scissors. And finally you are done cutting. Play around with the mix until you are happy. There's not a whole lot of options, but make sure you have 3 different colours in each block. Build one block start to finish first, to get a feel for it. Take you first 2 bottom pieces and mark a line at a scant 1/4". I started sewing where my pencil points, but you can start from the edge, just make sure you back stitch to secure the seam at that angle and cut it. Can you see on this photo how I haven't gone all the way to the edge? Add your next piece and sew again just to that middle, but not to the edge of the fabric. Don't forget to back stitch to finish at the meeting point. See that wasn't too hard, was it? Now just one more seam and you are put together! Lay your two fabrics so that they lay on top of each other ( the black and red in this case) and stitch. Don't cross any seams at the middle meeting point. And now press from the back to get your seams to lay nicely. Trim it to 6.5" square. If your block is too small, you have made too big a seam allowance. Just put your other three together, and voila! I hope this opens up the world of y-seams. Look online too, there are LOTS of tutorials on how to do y-seams. Have fun and make some blocks. You must make four 6.5" blocks for one block lotto. So, four blocks equals one ticket. Make four, make eight, make a dozen.